My Dad by his plane. USMC Sgt. 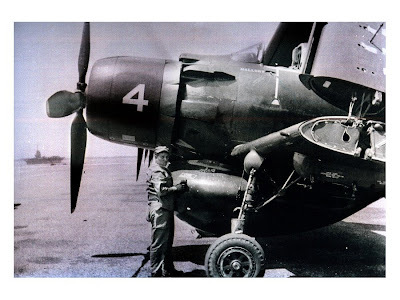 Merle Mallory was Crew Chief for a Hell Cat reconnaissance plane on a carrier stationed out of Guantanamo Bay during the Korean Conflict in the 1950's. I'm proud of his service. This Independence Day, say a prayer for all the men and women currently serving in harms way, as well as for their families. And tell them "Thank you" for all their hard work and sacrifice, even if you disagree with the Administration policies that put them in danger. Your Republican frontrunner for 2012!! !